Our professionally-produced Thai Street Vendor videos are known and loved for their simplicity in teaching anyone how to cook authentic Thai food like an experienced street vendor. 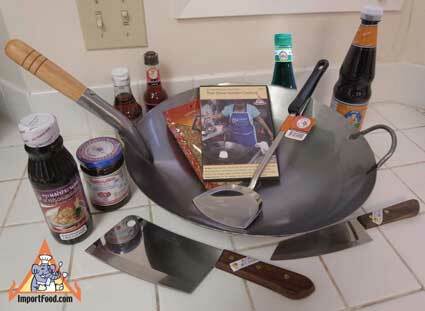 As a gift for yourself or someone who likes Thai food, here is an ideal kit. We included all of the important cookware and ingredients to start cooking. The street vendor wok comes with printed instructions on how to season it. Also included is the Zebra long-handle stainless work turner, our Street Vendor DVD 1 with a booklet inside, and much more as listed below. A fantastic value. As a direct importer of the finest food & cookware from Thailand, only we can offer such a great deal. 1 Prik Pao 1 Thai Cleaver 6"